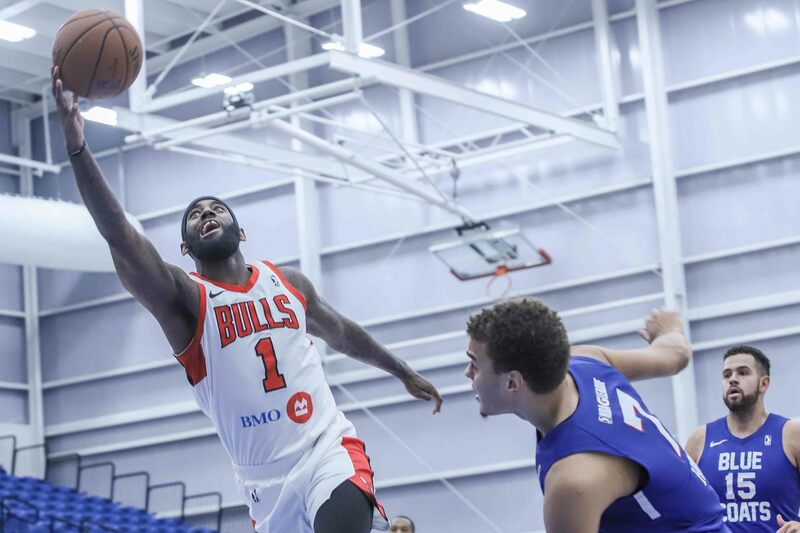 The Windy City Bulls, presented by BMO Harris Bank, the NBA G League affiliate of the Chicago Bulls, snapped their two-game losing streak with a 119-110 victory over the Delaware Blue Coats on Wednesday night at 76ers Fieldhouse. The Bulls were short-handed as they were without the services of both Two-Way players who were called up by the Chicago Bulls. 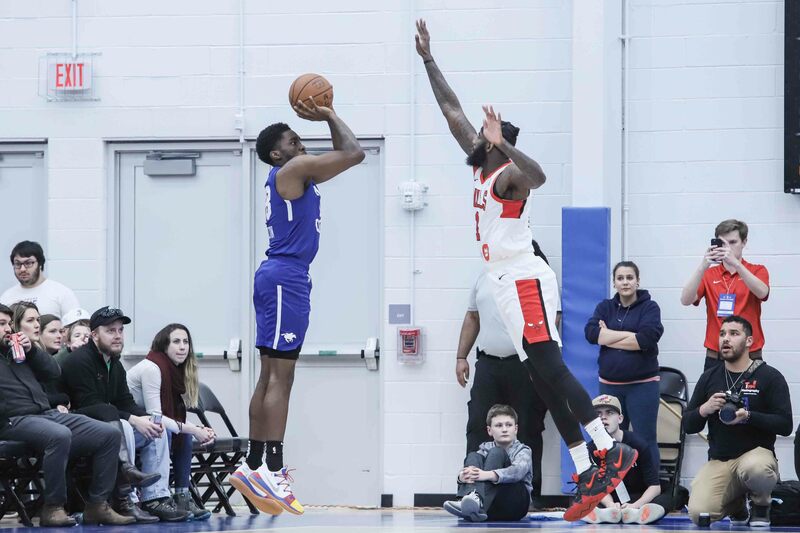 Wednesday’s win served as a team effort, as seven Windy City players scored in double figures led by JaKarr Sampson who tallied his 600th field goal, eclipsed 1,500 career points and notched a game-high 21 points. Kaiser Gates collected his seventh double-double of the season and posted 20 points and career-high 15 rebounds, while Walt Lemon Jr. totaled 20 points on 8-of-11 shooting. Thomas Wilder and Jon Octeus had 12 points apiece off the bench, Mychal Mulder added 11 points and Ferrakohn Hall pitched in with 10 points. Six Blue Coats tallied 10 or more points with Two-Way player Shake Milton leading the way with 21 points. Ryan Anderson totaled 19 points and 17 rebounds, while Jared Brownridge collected 19 points of his own. Denver Nuggets assignment player, Jarred Vanderbilt had 14 points and seven rebounds in a reserve role and Keenan Evans pitched in with 13 points and four assists. Windy City tallied the first basket of the game as Lemon Jr. hit Mulder for a cutting layup. The Bulls had a robust offensive start as they made six of their first eight field goals and led 12-8 at the first media timeout. Windy City led by as many as six on a few occasions, but with three minutes left to play in the quarter, the Blue Coats took their first lead of the night on a three-pointer by Vanderbilt. Delaware led by as many as four, but the Bulls regained the advantage on three consecutive threes by Beachem, Wilder, and Gates to end the period. In total, Windy City shot 60 percent from the field, 57 percent from three and led 30-27 at the end of the opening 12 minutes. Delaware scored the first four points of the second quarter, but the Bulls responded with a 15-0 run of their own to grab their first double-digit lead of the night. Meanwhile, the Blue Coats had an offensive drought that lasted nearly four minutes until Brownridge ended their scoreless streak with a long ball at the 7:21 mark. Windy City led by as many as 16, but with 30 seconds left in the half, Delaware cut the lead to eight and eventually pulled to within seven. 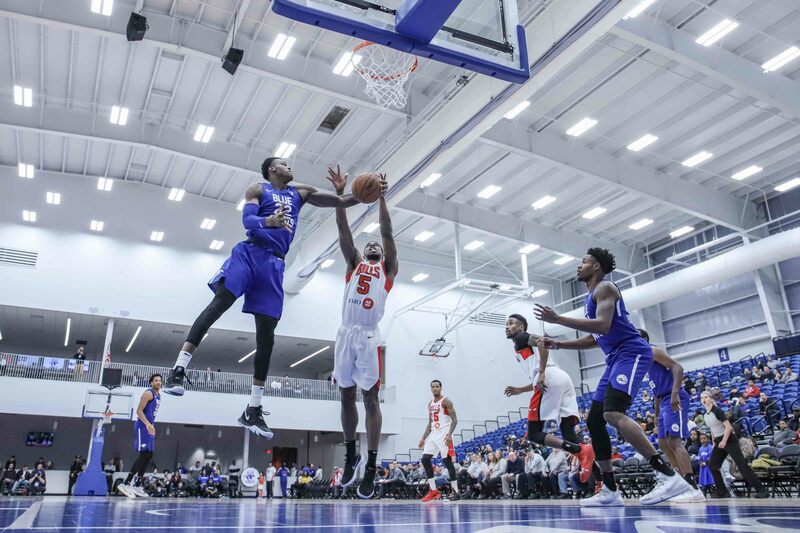 The Blue Coats were unable to draw closer as the Bulls shot 62 percent in the half, capped off by a buzzer-beating half-court shot by Lemon Jr. as the half expired. Conversely, Windy City held the Blue Coats to 43 percent shooting and led 62-52 at the intermission. The Blue Coats owned the first basket of the second half and began the third quarter by scoring nine of the first 14 points. The hot start to the period trimmed the Bulls lead to six, which forced a Windy City timeout at the 8:53 mark. Delaware eventually made it a one-possession game and with just over seven minutes remaining the period, the Blue Coats recaptured the lead on a three by Highsmith. The final six minutes of the frame featured seven ties and 13 lead changes. For the quarter, the Blue Coats outscored the Bulls by 13 and led 88-85 heading into the final 12 minutes. In similar fashion to the third quarter, Delaware collected the first basket of the final frame to lead by six, their largest of the night. Their lead didn’t last long as Windy City rattled off three straight threes once more and led by five. The 9-0 stretch is what ultimately sealed a Bulls win as they didn’t trail from that point on. After surrendering 36 points in the third quarter, Windy City held the Blue Coats to just 22 points in the final quarter. The Bulls outpaced Delaware by 12 in the final frame and won convincingly, 119-112. With the win, Windy City improves to .500 and are a half game behind the Fort Wayne Mad Ants for first place in the central division. The victory also snapped the Bulls two-game road losing streak. The Bulls will enjoy two days off before heading to Cleveland to take on the Canton Charge on Saturday afternoon. Tip-off at Quicken Loans Arena, home of the Cleveland Cavaliers, is set for 1:00pm CT.